What Age Is the Right One to Learn Horse-Riding? Learning a new sport or hobby is something that takes time and effort, especially from a young age. If it’s something that you want your kids to get involved in, or if it’s something that they saw on TV or in a film that they want to do straight away, you can either refuse to let them or encourage them every step of the way. With something like horse-riding, it’s best to take the second approach. If you want to get your kids into riding a horse, you shouldn’t start as soon as they learn how to walk; this may be too early. The best time to start is when they’re aged five or six, possibly. That said, everyone is different and will learn from different ages. At this age they will probably be tall enough to at least ride a small pony. When it comes to the learning process, what else should be taken into consideration? With many sports, it’s possible to teach them yourself, especially if you have a big yard, but that’s not the case when teaching your kids how to ride a horse. The best possible option is to enrol them in a pony club camp or horse riding school, even if it’s just for a few weeks. This can save time and effort, plus your kids will be in safe hands and will learn from people with experience. As mentioned in a blog post by event rider Harriet Morris-Baumber, there are plenty of other things that you need to know about and do when trying to help your children learn horse riding besides just enrolling them onto a course run by a Pony Club camp. Plenty of preparation before they begin to learn, for example, is just as essential. Before they even begin to learn, ensure that your kids have everything they need in terms of equipment. A riding helmet, jodhpurs, a riding jacket and riding boots are all important, as is a saddle. Riding a horse (or pony) without all that can be dangerous and far from enjoyable for your son or daughter. 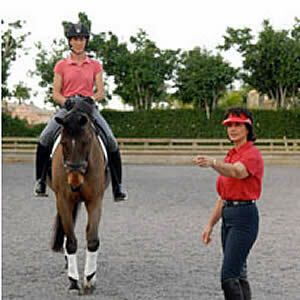 What’s just as important, if not more so, is that your kids should enjoy their horse riding lessons. If done safely, it can be one of the most exciting activities they can possibly do. Enjoyment is the first thing your kids should get from a Pony Club, even if they’re learning something that they find difficult. As horse riding can be so exciting, it’s just one of the things that can help to keep the kids occupied during the summer break. If you suggest learning to ride to your kids, the worst thing they can do is refuse the idea. December 18, 2012 – If you only use your hands when putting your horse on the bit, you’re making one of the biggest mistakes you can make. By focusing on the head and “getting the head down”, you’ll just be creating an artificial “head-set”. Putting your horse on the bit has nothing to do with “head-sets”. Physically, when your horse is on the bit, he has a round silhouette that only occurs when you ride him from behind, over his back, through his neck, and into your hands (and at that point the energy can be recycled back to the hind legs). Mentally, a horse that is on the bit is “on the aids” and anything (like a transition, extension, or stepping into a lateral exercise) is possible within the next step. When you’re working on putting your horse on the bit, remember to always FIRST use your driving aids before you use your reins. You want to create a surge from behind as if you’re starting a lengthening. 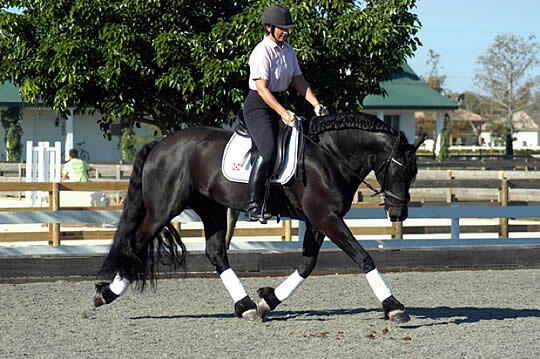 October 8, 2012 – No matter where I travel, the most frequently asked questions I get are, “How do I put my dressage horse on the bit… and how do I keep him there consistently?” This concept baffles many riders. My hope here is to simplify the process for you by explaining how to give what I call “connecting aids”. First, you need to know that the “connecting aids” are the SPECIFIC AIDS you’ll use to put your horse on the bit. It’s an AID just like there is a specific aid to ask for canter or for a leg yield. 1) The reason we give connecting aids is to bring the horse to a more perfect state of balance. Motivation is an interesting topic. I’m very motivated when food is involved. Just shake a can of pellets, and I’ll sing and dance for you! Okay, okay. I nicker and stomp. But you know what I mean. If Jane corrects me, she always follows up by “retesting” me with the same question. The retest gives me the opportunity to be rewarded for doing things right. And that inspires me to do them right the next time. I guess you can say I’m motivated by reward. If you know what motivates you, you can set yourself up for success. Think about whether you’re a “move away from pain” or a “move toward pleasure” kind of person. Pay attention to your choices. Then use that knowledge to plan the path to your next important goal. I’m really motivated by carrots. If you’re coming over would you bring me some? I’ll sing and dance for you! Just watch your toes! 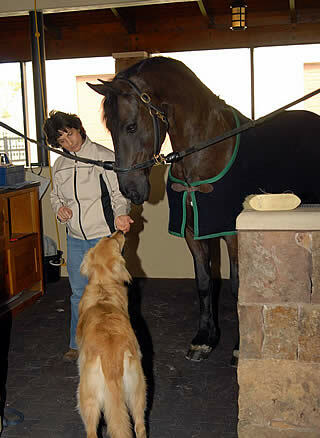 Many riders have a hard time getting their horses to pick up the correct lead in one direction. There can be many reasons for your horse picking up the wrong lead. Here are two exercises that can help you with this problem. The first exercise increases bend. The second exercise engages the strike-off leg. You want to increase the bend because horses pick up whatever lead they’re bent and flexed toward. Gradually decrease the size of the circle by spiraling in. The pattern looks like the swirl on an all day sucker lollipop. As the circle gets smaller, the bend increases. Keep your inside leg on the girth, switch your weight to your outside seatbone, and leg yield back out to the larger circle with bend. Make sure your horse bends as much BEHIND your leg as he does in his neck. Do the spiral in/leg yield out exercise several times. When you feel him bending well, ask for the canter WHILE you’re still going sideways in the leg yield. Many riders don’t realize that the reason they have trouble sitting the trot is because their horses aren’t on the bit. No matter how good a rider you are, it’s nearly impossible to sit on a back that is stiff and hollow. The key to making both you and your horse more comfortable in sitting trot is to connect him so his back is round. You do that with what I call “the “connecting aids”. Before give connecting aids, however, check that your horse “thinks forward”. That is, when you close both calves, does he surge forward immediately and with conviction? If he doesn’t surge forward from light leg aids, give him a couple of taps with the whip or a couple of bumps with your legs to chase him forward. 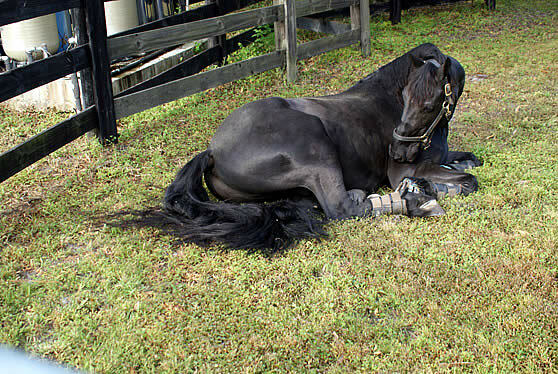 Many riders are confused about how to tell if their horses are honestly on the bit. Below is a description of what it looks and feels like when your horse is honestly connected. 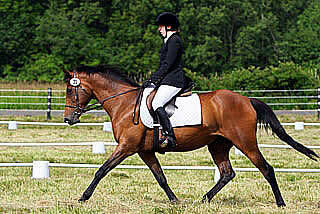 Hindquarters: You want to see active hindquarters and your horse stepping well under himself. 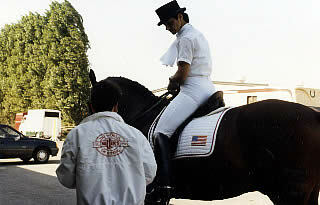 Back: Just behind the saddle, the back should look round, not dipped and hollow. Neck: If you’re sitting on your horse and looking at his neck, it should be widest at the base, just in front of the withers, and get progressively narrower toward his ears. If you’re looking at your horse’s neck from the side and you see a dip 4 or 5 inches in front of the withers (or a narrow area when viewed from above), that’s a visual signal that he is not really ‘through’ and connected. If the neck is widest in middle, or widest up by the ears, then your horse is being pulled into a frame instead of being correctly connected from back to front. He should get ‘pumped up’ or ‘bloom’ at the base of the neck, meaning it’s the widest point. Poll: Ideally, the poll is the highest point. Nose: The nose should be 5 degrees in front of the vertical. All those things make you feel good right? I used to think so. I used to compliment all the other horses in the barn, thinking I would be helping their self-esteem by reminding them how great they are. But, new studies indicate that this may not be the case. I remind them that people have a different language than we do, and we horses need to learn to be “people whisperers.” That means we have to do our best to learn to listen to human commands with our ears, and to ignore the loud body language people scream at us. It’s very hard for us to do, as we naturally listen to body language much more readily than noise. People are very confusing and incongruent to equines, and sometimes the mixed signals make us a bit crazy. Dear fellow equine: When your human freely gives you lots of treats or lets you push her around with your nose, that means she loves you, not that you’re her boss. I know it is uncomfortable and confusing because to you this behavior means you’re in charge, but you need to learn to tolerate this and not take over. Try not to get confused when she then turns around and asks you to yield your feet to her direction and control.